Unfortunately we live in a society where the dominant intellectual culture rejects astrology out of hand without bothering to test its prejudice at all. It’s obviously all nonsense and anyone who believes in it must be a halfwit. On the occasions when it does appear to work, this is just dismissed by the catch all that people behave like their Zodiac signs because they know that they were born in that particular month and that knowledge conditions their behaviour.Whilst it is probably true that most people are aware of their Sun sign, very few have any knowledge, conscious or otherwise of any astrological features other than that. This fact doesn’t stop them behaving in the way that is indicated by the positions of the other planets at the moment of their birth, as all the articles on this site testify. The human brain apparently is an extraordinarily self deceiving entity. We see the world in a certain way, because it suits us or we have been conditioned to do so. Only the scientists appear to have an objective sense of the state of things, the rest of us are propelled along by a hotchpotch of illusions and fantasies that centre around astrology and religion. An important part of this intellectual fascism is the assumption that it’s the scientific thinkers of today that hold all the cards. Anyone born before the start of the 20th century is dismissed as being quaintly primitive and their understanding of the world around them, utterly naive and subjective. The further back in time we go the more stupid people were. This is an interesting way of perceiving history, but it is held so strongly by the dominant culture that no one sees that it is entirely based on intellectual egotism. If the human brain is such a self deceiving entity, then surely the more stuffed full of information it is, the more subjective it becomes. In times past, people were not so full up with stuff as they are today, and consequently lived their lives far more from what their actual senses told them about the world. Nowadays most people, including all the clever ones, are permanently wired up to their mobile phones so their reliance on their awareness of the actual world around them is probably no more than 10% of that of their great grandfathers. In the past astrology was taken as read, even by all the scientists. This is not because everyone was evolutionally inferior to the wonderful specimens of the current day. It was because people were more able to see the evidence of their own eyes. They could clearly see the movements of the planets in the night sky above them as they didn’t have a million and one other things to distract them from such an obvious sight. Nowadays the average person hardly ever looks up to the night sky above them, and if on an occasional holiday to somewhere not swamped by light pollution, they did get the chance to gaze at this awesome spectacle, its a fair guarantee that they would spend most of the time consulting the star gazing app on their phone which would authoritatively inform them about the largely irrelevant names given to these isolated and equally irrelevant distant points of light. So the really interesting point is that as people have become more distracted from the actual world around them their belief in astrology has diminished. Ultimately, nothing can be objective. The human brain is really just an instrument that is designed to perceive the world around it and to use and organise these perceptions in a way that will keep the organism alive and protected from assault. The scientists therefore say that we use such things as astrology and religion to create a construct that helps us cope with the great unknowable thing that is existence. Of course they neglect to say that they all use science for exactly the same reason. One approach is criticised and ridiculed, the other is lauded in the most noble fashion. But the chosen approach is just that, fashion. Since we are all entirely subjective and incapable of perceiving reality as it actually is, because the truth of it would cause our own brains and bodies to explode into millions of pieces, isn’t it a rational thing to choose a belief system that actually works, helping us to live our lives in a happier, peaceful and more fulfilled way. The so called irrelevant points of light in the night sky are there to guide us and help us through the difficult moments whenever our own illusory separate selves happen to bump into other ones. Our brains are naturally constructed to pick up information from the world around us in a way that helps us get by. Surely this should be thought of as an advantage rather than an illusion. One scientist who spent his life dealing with these issues was the apothecary Emile Coue. Coue noticed that in certain cases he could improve the efficacy of a given medicine by praising its effectiveness to the patient. He realized that those patients to whom he praised the medicine had a noticeable improvement when compared to patients to whom he said nothing. Coue believed in the effects of medication but he also believed that our mental state is able to affect and even amplify the action of these medications. By consciously using autosuggestion, he observed that his patients could cure themselves more efficiently by replacing their “thought of illness” with a new “thought of cure”. This is what medical practitioners would call the placebo effect and what anyone else would call the bringing of conscious brain and body together for the purpose that they were designed for effect. Coué developed a method which relied on the principle that any idea exclusively occupying the mind turns into reality, although only to the extent that the idea is within the realm of possibility. If someone believes that their illness is disappearing, then this may actually happen, as far as the body is actually able physically to overcome or control the illness. On the other hand, thinking negatively about the illness is likely to hinder recovery. This unbelievably obvious discovery still startles scientists when they find examples of it in action. It is still looked on as an unreliable human deception rather than as a fantastic possibility for dealing with the health of humanity that should be utilised as much as possible. Anybody would think that the brain and body are somehow connected and that messages from the former actually reach and impact on the latter ! Only in a world where people’s brains are exclusively connected to the internet rather than their own bodies could this be perceived as anything other than common sense. Coue’s experience led him to study hypnotism but he eventually focused on autosuggestion. His method was the repetition of the mantra “Every day, in every way, I’m getting better and better”. It centered on a routine repetition of this particular expression as much as twenty times a day, and especially at the beginning and at the end of each day. Coué maintained that curing some of our troubles requires a change in our unconscious thought, which can be achieved only by using our imagination. Thanks to his method, patients of all sorts would come to visit him. The list of ailments included kidney problems, diabetes, memory loss, stammering, weakness, atrophy and all sorts of physical and mental illnesses.According to one of his journal entries he apparently cured a patient of a uterus prolapse as well as migraine. The success rate of his method was claimed to be around 93%.The remaining 7% of people would include those who were too skeptical of Coué’s approach and those who refused to recognize it. When asked whether or not he thought of himself as healer, Coué often stated that “I have never cured anyone in my life. All I do is show people how they can cure themselves.” Ask any real healer and they will say the same. The kind of healing method that relies on the use of the patient’s unconscious would have to come under the astrological rulership of Pisces and its interesting that Emile Coue has both the Sun and Neptune the sign ruler there. They are also in the 8th house of deep transformative experience. The mantra ” Every day, in every way, I’m getting better and better ” is so beautifully Arien in its strong desire to start from the present moment and the expansive improvement is classic Mars and Jupiter. The 9th house is the area of human understanding and growth of potential. So Coue’s Moon / Mars / Jupiter conjunction in early Aries in the 9th house could not be bettered ! One extremely interesting feature of Coue’s chart, particularly in the context of this article is the T Square between his Leo Ascendant in opposition to Mercury in Aquarius with an apex of Pluto in his 10th house. The Ascendant is the starting point in a chart and will often depict where we begin things whereas the Sun is our true path in life. Leo rising sits well with Emile Coue’s beginnings as a medical scientist. If any sign carries the complete certainty that they are fundamentally right because to their own noble inheritance, its Leo. Leos are like medieval monarchs who draw a train of servants along with them. As long as their servants know their place and don’t argue, the Leo personality will be very generous with its patronage. Anyone who does not accept their place is sent to the Tower. 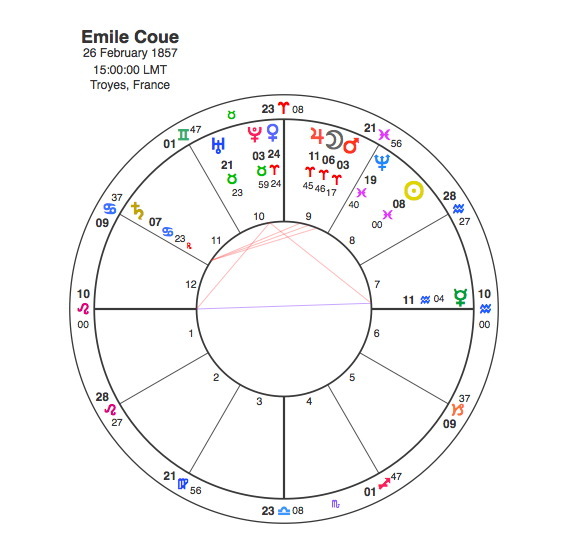 Emile Coue however had Leo rising in opposition to Mercury in Aquarius. Aquarius is the opposite of Leo because it preaches revolution and the end of the divine right to rule. Coue had original and revolutionary ideas that were confirmed by his work as an apothecary and his observations of the results on his patients. The tension between his membership of the medical establishment ( Leo Ascendant ) and these original ideas ( Mercury in Aquarius ) was projected onto the apex planet, Pluto. Pluto, as we all know rules sudden, dramatic and far reaching transformation. Pluto is in Coue’s 10th house of career. The result was a complete change of career, from conventional medicine to self hypnosis. There is no clear indication of when Coue first made his discoveries but Capricorn Research is prepared to bet that it was between 1890 and 1894, when Pluto was square his Sun. The one thing that is clear is that his book ” Self-Mastery Through Conscious Autosuggestion “ was published in 1920 when Pluto was square to his Moon. One important point about Pisceans is that as the last in the Zodiac, they have the least attachment to their own egos of any of the signs. For those of us with the ability to step back from the egotistical cultural hegemony of our time, to assimilate something of the wonderful science of astrology, we have to admit the understanding that it brings enables our lives to get better each day. For anyone whose life is getting worse, why not try it – what’s the worst thing that can happen ?